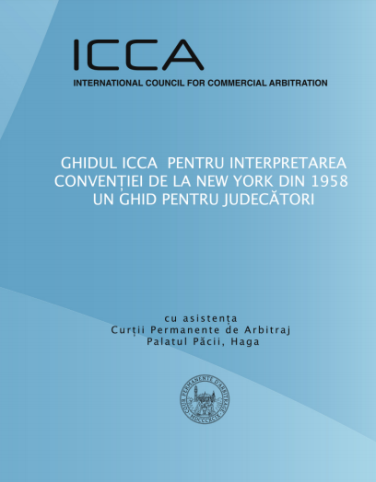 We are pleased to announce that LDDP’ lawyers had translated into Romanian the ICCA’s Guide to the interpretation of the 1958 New York Convention – A Handbook for Judges under International Council for Commercial Arbitration auspicies with the assistance of the Permanent Court of Arbitration, Hague. It is the first translation of this Guide into Romanian, process conducted by a team of lawyers from our office, respectively: Associate Professor PhD. Crenguta LEAUA, Professor PhD. Stefan DEACONU and Lawyer Calin COSMA. The Romanian version, as has been translated, is available and can be consulted, as well as downloaded free of charge at https://www.arbitration-icca.org/media/11/59130972264406/icca_guide_nyc_romanian.pdf. Reproduction and copying this Guide is allowed and even encouraged for the Romanian Courts, provided that the text is reproduced accurately, without alteration and taking into consideration that ICCA’s autorship and copyright, respectively the translators’ rights for the Romanian version which have to be clearly acknowledged. The 1958 New York Convention on the Recognition and Enforcement of Foreign Arbitral Awards is the cornerstone of international commercial arbitration. The translation of this Guide into Romanian has the goal to provide those judges who are dealing with requests based upon recognition and enforcement of the arbitral award, simple explanations on how to interpret its text in accordance with the best international practice developed during the years. Being considered an useful tool for both judges and arbitration practitioners, the Guide highlight in a concise, clear and simple style the questions to be answered and the steps to be followed by Courts when applying the 1958 New York Convention. We are thus hoping that this Guide will also play an important role in assisting judges to participate in this continue application and harmonization process of the 1958 New York Convention in a consistent way with its letter and spirit. Learn more about LDDP’s expertize here. Crenguta LEAUA, moderator of the debate "Blockchain legal issues"